Wednesday, November 2, 2011: Scuba Leslie Koepitz and Deep Diver Paula Persons were seen in the Brainerd Dispatch newspaper as they were leaving the water at one of the mine pits near Crosby, Minnesota. Yes, there were some name misspellings in the newspaper. 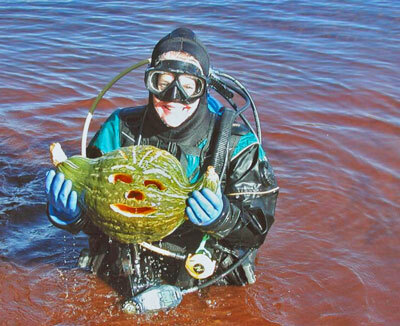 They were there for the Minnesota School of Diving annual underwater pumpkin diving contest. Leslie won the overall competition with a pumpkin that looked like a tree with a face. Extremely clever. 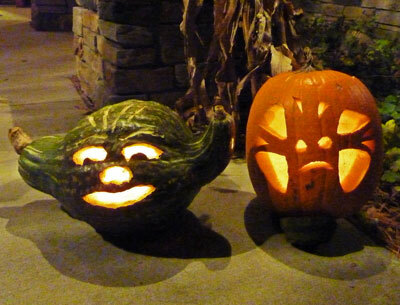 Paula's pumpkin/gourd, Yoda of Star Wars fame, won the "most innovative" award. Here is the way they looked on Halloween. Paula's is on the left and Leslie's is on the right. Carving underwater is a difficult pursuit at best.